It’s dreadful. That time of the month rolls around and the change in your body is unstoppable: you’re emotional, tired, maybe a little short fused, and the cramps—oh yeah, the cramps. Are we being punished by nature because we’re not pregnant? It’s possible. Do we feel like tucking ourselves away in a hut until we have regained control of our psyche? You betcha. Since our society doesn’t allow us to take a week off every month to deal with nature’s call, we have to find ways to make life easier for ourselves (and our coworkers, who are all but forced to share our pre-menstrual energies). Black cohosh root is known for its anti-inflammatory and mild sedative properties and has long been a favorite of Native Americans to help with the pain and stress of PMS. It helps stop those painful cramps and irritability, and it can help the body regulate and balance the hormonal cycle as well. For those of you who may be in or transitioning to menopause, black cohosh has also been found to be extremely effective in reducing hot flashes, mood swings, and irritability. It is also being considered as an excellent alternative for women who aren’t interested in going through estrogen replacement therapy! Black cohosh has been used to induce pregnancy, but it is not considered safe to take during pregnancy. Motherwort got its name from the Greeks, who gave it to expecting mothers to calm their anxiety in childbirth. It is commonly used for matters of the heart and of the uterus (both in the physical and metaphysical worlds). Motherwort is amazing for women in all stages of life! For PMS, Motherwort can be helpful to relieve painful cramps and strengthen the uterine muscles against cramping. It can also be used to bring on bleeding that is suppressed or delayed from anxiety or stress. Motherwort is a gentle hormonal regulator when used in combination with other herbs, but because of the affinity with the heart and blood, it should not be used when bleeding is very heavy. Motherwort should not be used during pregnancy, but it can help relieve the contraction pains during the early stages of labor. For a new mother that is feeling anxious tension, motherwort can become a best friend, it opens up the heart to mother’s love and has been used to treat postpartum depression. This is another helping hand for the change of life ladies, too! Motherwort has been used to help relieve the symptoms of menopause. The name should give this one away—cramp bark is used for all sorts of muscle cramps and spasms, especially menstrual cramps. It has all the necessary actions for being an awesome time-of-the-month remedy: antispasmodic, astringent, and anti-inflammatory. Use a heaping teaspoon for every cup of water and make a tea from the bark to drink before and during your period. It’s great for easing bloating and cramps before your period, and to slow heavy bleeding throughout the week. It can be used safely during pregnancy to quell a number of complications, but only use it under the guidance of a trained phytotherapist. Red raspberry—yes, that thorny vine with the delicious berries taking over your backyard—has a long tradition of being used during the last trimester of pregnancy to help strengthen and tone the uterus. An herbalist friend of mine drank a cup of the leaf tea every evening during the last months of her pregnancy and said it gave her back a sense of control that she felt she had lost during the whirlwind of emotions that come with motherhood. Women often use red raspberry before and during their menstrual cycle, as it is an anti-inflammatory and an awesome cardiac herb. The actions have a calming effect on the uterine muscles while stimulating and regulating the blood flow. It is used to help with painful menstrual cramps before and during your cycle. Note: If you’re drying it yourself, make sure that it is totally dry before consuming it. There is a component released while it is drying that is difficult to digest. Because of her affinity to Artemis, the Greek Goddess of the forest, fertility, and of women in all stages of life, mugwort is my personal favorite herbal therapy for all things womanly—from protection and strength to balance and stress relief. It is said to have gotten it’s name because it was used in medieval times to flavor beer (Get it? A ‘mug’ of beer!) and it is commonly used to bring on lucid dreaming. Mugwort is a bitter herb that also functions as a nerve tonic. It helps calm the stress and tension that can completely throw your cycle off, so use this strong herbal lady to stimulate the menstrual flow and to balance the reproductive cycle. Mugwort can be taken as a tea or an extract, and should be taken in the evening because it is so calming. This is another herb you’ll want to listen to when you’re working with it because it is used to bring on lucid dreaming and it is seen as a third eye opener in many cultures. It is said that carrying a sprig of mugwort with you promotes fertility and increases libido but do not use mugwort internally if you are pregnant or trying to get pregnant. Don’t. Do. It. 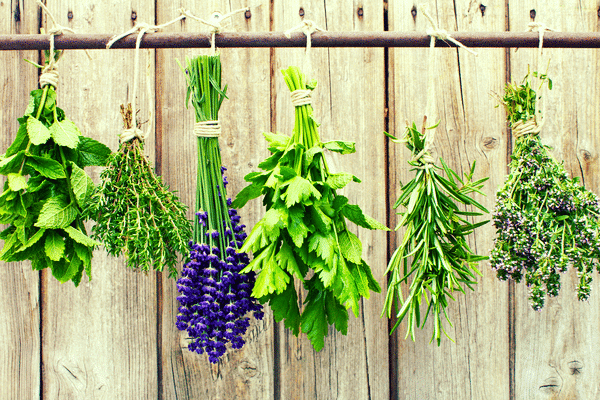 Do you have a favorite herb for your monthly cycle? Tell us in the comments below! I come across an article that mentioned it’s uses for PMS and endometriosis, so I’ll have to see what else I can find on it. The Chinese herb Dong Quai works amazingly well for swollen tender breasts and cramping. I take the extract, 2 times a day, starting a few days before my period. If you continue to take it after the first day of your period be aware that your flow will be heavier but your period will be shorter!